Some were good and some were not. Are those of the carousel and rides in the park. And head out for a little place called Carey Park. For a nickel a ride we could ride all day. Meet us back at the fountain, before it turns dark. The rides were plenty, the food was great. That would lap around the park and we'd grin. It was all about Sunday in Hutchinson. We'd wait all week, for that day to begin. Now the rides are gone, and not much remains. Just the great big fire truck, and memories of then. I hear they'll bring them back, then I hear they will not. The folks who control money, left their childhood behind. On things that make memories, like yours and mine. 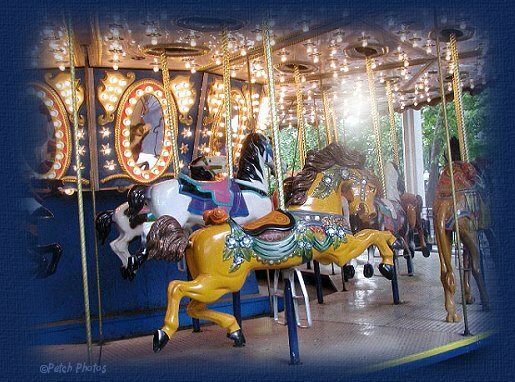 The carousel full of excitement, laughter and the thrills. My little home town and the park called "Carey".